Rosebery Road runs between Angel Road and St Clement's Hill in New Catton, to the north of the city centre, and this elegant little church is signposted from both ends. The foundation stones give the date of opening as March 12th 1908, and looking at the cast iron signposts I thought that they were probably original, dating from the days when the church was built. The housing of Rosebery Road is of a similar date. In 1958, fifty years after the church was opened, it was gutted by fire, and so presumably none of the original furnishings have survived. The church website tells us that many organisations... helped raise funds for the restoration - it would be nice to think that this would be just as true if it happened today. Last year, Rosebery Road Methodist Church celebrated its centenary. 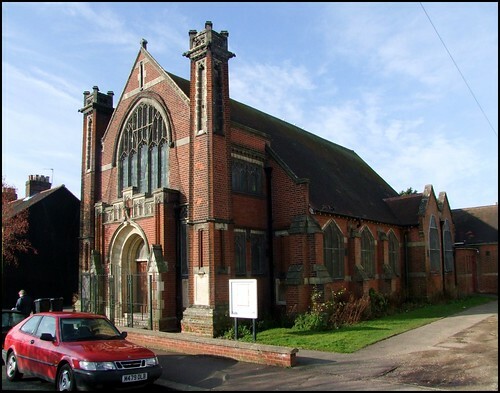 This red brick structure is roughly Perpendicular in style, and is similar to the contemporary Bramford Road Methodist Church in Ipswich. One nice touch here, though, is the pair of towers which flank the frontage. They taper assymetrically, in a manner reminiscent of the work of Charles Rennie Mackintosh in Glasgow and elsewhere, and it would not be fanciful to see a hint of East Anglian Art Nouveau about them. Otherwise, all is familiar from other churches of this denomination at the turn of the 20th Century, when it was reaching the peak of its influence. This is one of several Norwich churches where a foundation stone was unveiled by the local MP, Sir George White, whose name is a common one to find on buildings in the city. Today, Methodist congregations are hemorrhaging faster than just about any other, and although this still seems a lively church, it will be important in the future that fine buildings like this one are not lost to us. It is a pity that it was not recorded in even the revised Norfolk Pevsner; not only would this be a reminder to future generations of its significance, but might also have let us know who the architect was.